Play Ultra Hot™ deluxe online for free now! Play Ultra Hot™ deluxe free online! Ultra Hot Deluxe is an outright classic among slots and that is probably the reason why it's one of the most popular slots in our Online Casino! The game, which is amazingly produced by Novoline, shines especially due to its simplicity: it is played on three reels only, and eight symbols are more than enough to experience passionate gaming fun! What’s more, you can play this vintage hit free at GameTwist provided you have a sufficient number of Twists in your player account. In terms of content, Ultra Hot Deluxe joins the ranks of iconic fruit slots and is on a par with all-time classics like Sizzling Hot and Fruits’n Sevens. 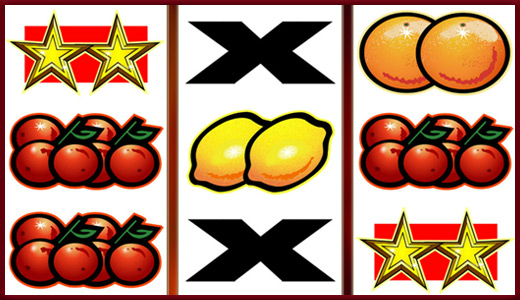 Plums, Lemons, Oranges and Cherries land on the reels and are complemented, amongst others, by the 7 and Star symbols as well as the BAR symbol. In other words, symbols that have been around since the advent of slots. Here we’ve summarised the most important facts about the slot Ultra Hot and slot games in general! Ultra Hot Deluxe is a classic fruit slot with three reels and five win lines. The aim of this game is to land a symbol three times along one of the win lines because then a very large win awaits you! You can find specifics about the symbols' values as well as detailed rules on the game screen. Simply hit the blue button “Winnings” and read the most important info about Ultra Hot. Play like in a real casino, wherever you are! Novoline games such as Ultra Hot Deluxe are special in more ways than one. For one thing, they often have the so-called Gamble feature. What does that mean? It’s simple: with a little luck, you can double your winnings! To this end, simply click on the orange “Gamble” button following a round win, correctly guess the card colour and pocket a large win! If you get it wrong, you can return to the main game and try your luck again with another bet. Who knows, maybe the Gamble function will soon be one of your favourites! Moreover, you don't have to visit a game arcade any longer to play the best casino games because thanks to online casinos gaming fun is available from the comfort of your home or on the go! Enjoy Ultra Hot online on your computer or on smaller screens - the game has been specifically adapted for smartphones and tablets as it befits a Novoline slot! Did you just enjoy a round of Ultra Hot or another Novomatic game? Did you rejoice at the sight of the occasional symbol in multiple versions? Are you curious about other online games? Then it's high time for a discovery tour through the vast GameTwist universe! How about thrilling adventure games (Book of Ra, Columbus deluxe and many more! ), divine or diabolical slots (unmitigated user favourite: Lord of the Ocean and Faust! ), a date with the Lucky Lady or brand-new games about rock stars or movie classics (highly exciting: From Dusk Till Dawn)? Or would you rather play outright casino evergreens like Roulette, Blackjack or Poker? No matter which game you pick, you will definitely find the right game at GameTwist! 1889: Inventor Charles August Fey developed a slot machine called “Liberty Bell” in San Francisco that became one of the most popular slot games in the US within a few years. Fey created numerous slot machines until the age of 82 and also provided many ground-breaking improvements. 20th century: The popularity of slot machines grew and spread across the entire globe. 1990: the first online casinos emerged and paved the way for playing casino games on the computer. Only a few years later the first games for mobile phones or smartphones appeared and created another boom for online casinos. What will be the next chapter in the great success story of casinos? One thing is for certain: Novoline will decisively push the development of slots and create many more games that will be the talk of the town! If you are a dab hand at Ultra Hot or other Novomatic games, it's high time to take part in one of our regular promotions or our popular leaderboard games. That way, you can compete with other gamers and grab the occasional win as well as plenty of other special benefits. During our promotions, vouchers and other treats will be handed out on a regular basis. Fancy it? Then visit the GameTwist homepage and always stay on top of things! If you have subscribed to our newsletter, the latest news will land directly in your inbox via e-mail. All you have to do is follow the instructions, meet the promotion criteria and, most of all, have fun! Bets are rewarded with a little luck in all our casino games. And if Lady Luck gives you a smacker, you might hit the odd jackpot! We’ll keep our fingers crossed for your casino adventure, whether you play Ultra Hot or another top game.